Polyurethane bushings to fit these arms are readily available from many aftermarket suppliers. A nice upgrade over worn out rubber ones. 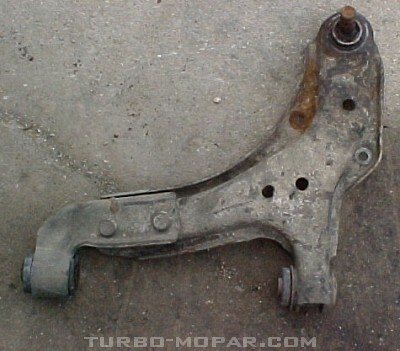 The S-body (Van) A arms can be made to fit the other body styles without much work, if using car bushings the inside hole on the stub strut bushings may need to be enlarged. The S-body arms are boxed underneath for increased stiffness and have a larger diameter shaft on the stub strut. This style was never used on the vans so a beefier alternative was never made, they could be easily boxed however if additional strength is needed. Polyurethane bushings cost less than the factory replacements and are a nice upgrade. Move Wheels forward and can cause tire/fender clearance issues on some cars. Polyurethane bushings are available for thes control arms from a few major manufacturers and are a decent upgrade over the stock soft rubber bushings. 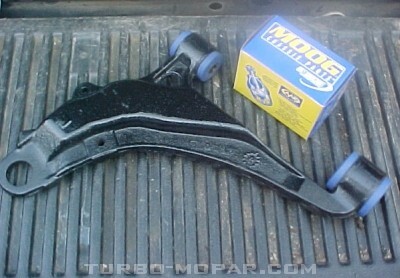 These control arms will bolt right in on any 89-90 car without a K-frame swap, but they will move the wheel slightly by ~1/2" and increase positive caster. For some the offset and increased caster is a benefit. For other's the fact that the wheel is moved about 1/2" forward in the wheelwell causes clearance issues with ground effects. 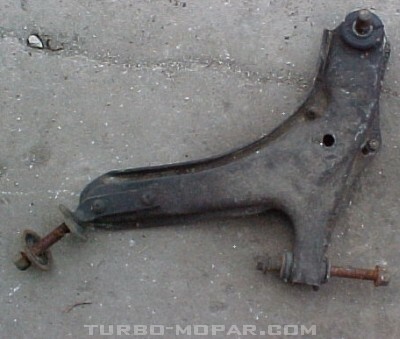 Note: The cast arm forward offset does vary based on the machining of the cast control arm. If machined in the center of the ball joint boss the offset is minimal. Most control arms are machined on the forward edge of the balljoint boss which moves the wheel forward an additional 3/8"
The C body cast control arms are similar but INCOMPATIBLE with Kbased cars. They have a different angle and different sized bushing and must be avoided. This page has been seen 2,155 times.